Hello darlings, I wish you all a peaceful sunday. I can not belive that it's already September. Summer got by so fast that we're nearly in fall. Actually fall is one of my favourite seasons of the year so I'm pretty excited to wear sweaters again and pull my hair back when it's windy! 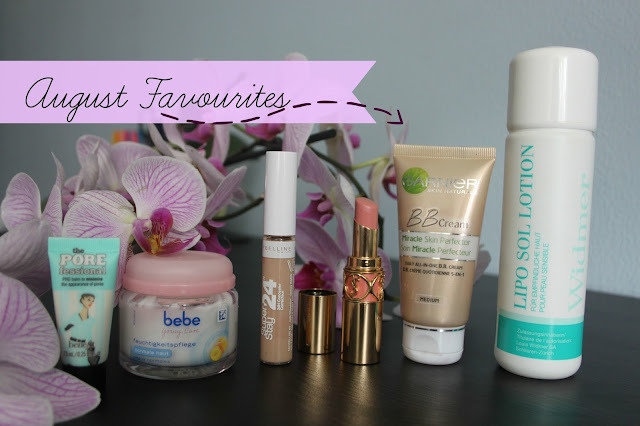 So with further talking... it's time for my monthly favourites. So this month it was all about skin care and makeup. The Porefessional - Benefit is the primer I've been using for the last couple of weeks. What I like about it is the size. Earlier I went on holidays so it's the perfect size to carry in the makeup bag. I don't own many primers that help me minimize the appearance of pores but this one from Benefit surely does. I've noticed that my pores aren't as visible as they were before using this primer. I'm not quite a fan of drugstore moisturizers because of my really oily and acne skin. So for the last couple of years I've only been using a moisturizer that my dermatologist has recommend me. But I wanted to try a drugstore moisturizer. So I came across the Bebe Young Care cream for normal skin. It's great for medium dry skin as it doesn't leave an oily film on your face. The scent is really like this one smells of peach but I would prefer a bit a softer scent. But for a cheap drugstore cream this is really good! I was in the market searching for a concealer and came across the Maybelline Super Stay 24H Concealer. I been using this product for about two months now and it lasted for quite a while. This concealer is quite cheap and it comes in a lipgloss jar, so you only need a bit of it. I used this concealer as a preparation to my Estée Lauder concealer to cancel out dark circles. I mentioned this YSL Rouge Volupté Lipstick in Impetuous Beige 107 a while ago and it's still one of my favourite lipsticks for summer. I leave you the link here if you want to read the whole review. The Garnier BB Cream Miracle Skin Perfector is the BB cream I've used during my holidays. When I'm on holidays I tend to put less makeup on. But still I can't go without BB Cream. This BB cream is not too heavy but still gives colour and a bit of coverage. I'm looking forward to review it for you this month! And last but not least the Lipo Sol Cleansing Lotion from Louis Widmer. My dermatologist recommend me this a while ago for my oily and acne-prone skin. It's a lovely cleanser that goes on my face gently and leaves it soft and really refreshed. I use it twice - in the morning and before I go to bed. I'm going to review this for you probably next month because I highly recommend this cleanser! I love your nice blog! All the products you show are great, especially the garnier bb cream and the YSL lipstick. awesome post,love the garnier cream and the lipstick too.That cream does wonders to the face.